Mills set to sign? | Through the seasons before us..
I’ve heard it from a couple of places now that Forest’s not inconsiderable courtship of Matthew Mills from Doncaster Rovers looks likely to be consummated over the next couple of days. Certainly still very much a rumour rather than a confirmed fact, but has been mentioned by folks who’ve proven reliable on such matters in the past, including Vital Forest, who seem to be experiencing a few technical glitches as I type. If it proves to be true then this will hopefully prove a cracking signing – certainly Rovers have not been keen to sell, but Saturday’s defensive frailties served as a reminder that the one position that Billy hasn’t made a signing for so far this summer is also in need of strengthening, so the acquisition of Mills would be good news indeed. 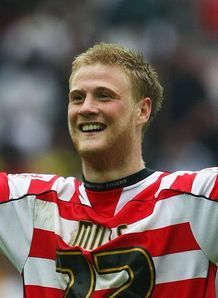 He signed for Rovers this time last year, having previously been on loan with them from Manchester City. If the figures of £2m+ are to be believed, then Donny would make a more than healthy profit on the £300k they paid for his services just a year ago. He’s a popular figure with the Rovers fans, and stood out particularly during their playoff final defeat of Leeds United to gain promotion after we’d snuck ahead of them into second place. I never got to read the details on the Vital Forest site, but whispers of tomorrow or wednesday for the news to be confirmed means it won’t be long before we learn whether or not this rumour has any basis in fact. Hopefully it does! Will wants Chambers out and I want wilson out. Whatever happens we need him or another experienced defender. Things are looking good !!!!!! Honestly say I have seen very little of Mills, but the fact BD seems so intent all summer, plus a couple of PL teams were chasing him, means for me he must be good and capable of playing at a higher level, which is exactly the sort of player we need to sign. Hoping the Joe Mattock rumours are true. I love Jules as a player, and what with signing Lynch we don’t exactly need another LB given a couple of months into the season, but this boy is class, and from what I have seen he will play for England, so to sign him would be a huge coup! We only paid 200k for Lynch so wouldn’t be a big issue to write that off. I think Wilson could be class for us, he just needs a slap and to be told he ain’t ever gonna be rio! A top CB signing and we can start to really look forward. If we signed Mattock then Leicester could beat us the next 300 times we played and we’d STILL be one up. Can’t see it happening though. All those other signings could be for naught if we don’t get another cb. Not liking the sheff utd rumours about big West either.